The beach Marina di Lobra is at the seaside of the village Massalubrense, about 5 kilometer in the west from Sorrento. This sweet, little beach is surrounded by typical cottages and landing places. 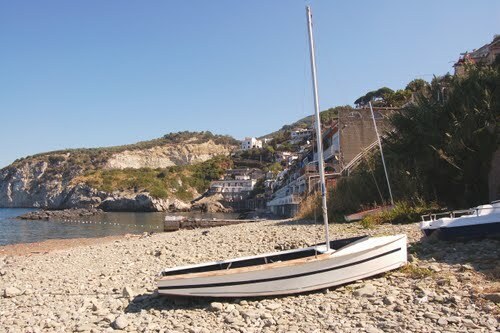 It is a very typical and charming Mediteranean village, surrounded by olive groves on the cliffs on both ends. This beach is particullary interesting for scuba divers, because here you'll find a diving school with the possibility to rent equipment to discover the fascinating underwater world alongside the cliffy shore. Moreover you'll also find a sailing school and a boat rental, thus it is the perfect spot for all those who are looking for more than just a sun bath and want to spice up their beach holidays with a little excitement, fun and sports. View at google maps "Beach in a small fishing village west of Sorrento with a diving school"